The Samsung E350 is an ultra-lightweight sliding phone that packs in an amazing number of features for a handset so tiny. At just 75 grams, the lightweight SGH-E350 is very easy to carry around. The antenna is tucked away inside the case to give the handset a smooth look and make it easier to carry around, and the compact size of just 84x43x21mm makes it easy to tuck away somewhere. 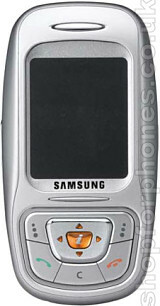 It doesn't skimp on features though - the Samsung E350 has a VGA resolution (0.3 megapixel) digital camera with a photo light and has a WAP browser and email client, Java support and polyphonic ringtones. It's certainly a cute phone, and the Samsung E350 promises to be great value for money too. If you want more information on the Samsung E350, subscribe to our mailing list. Also, the Update newsletter contains general news about new phone releases.